Imagine you have several really popular apps, and once you develop a new must-have application, of course you want to notify your users about it! Let’s consider that one of your users is really into your products, so he or she has 5 of your apps installed on a device. If you start promoting your new product with broadcast push notifications sent to each of your apps, this user will receive the same notification five times in a row. Just imagine how irritating it might be! That’s why we have an Application Groups feature, which allows you to send one push notification to several applications with one click, and those users who have two or more apps installed, will receive only one message! 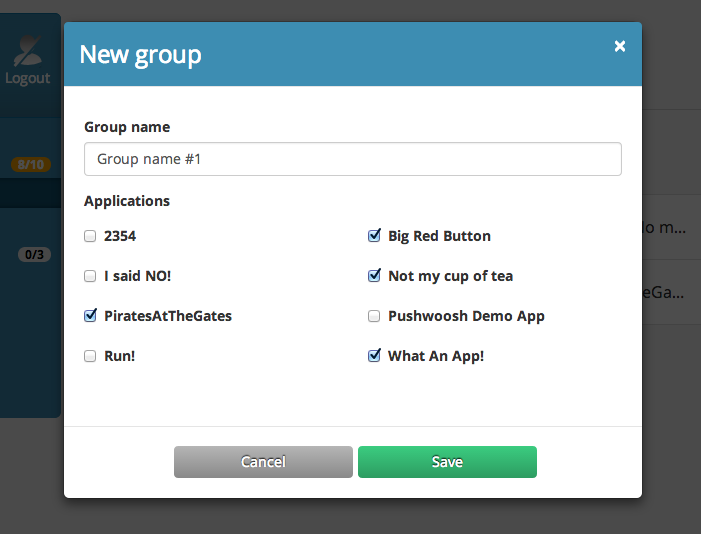 Go to Application Groups page of your Pushwoosh control Panel, and click Add New to create an application group. Write a name for the group, check the applications you’d like to add from a list, and save it. Now go to the Application Groups, and click on a group you’ve created, it will open Send Push for App Groups, where you can customize your notification just as those that you send to single apps.